Keni Harrison, left, won the women’s 100-meter hurdles in 12.60 seconds at the United States outdoor track and field championships. 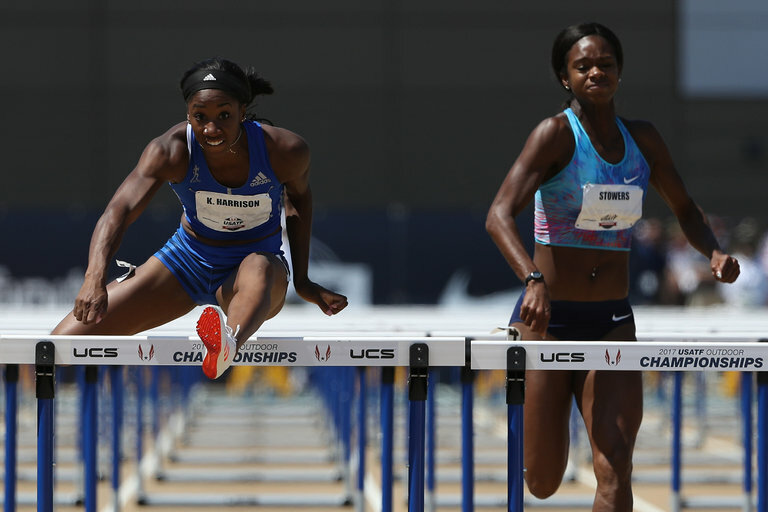 SACRAMENTO — Keni Harrison, the world-record holder in the 100-meter hurdles, used a strong start to win her first United States outdoor track and field championship on Saturday. Nia Ali, the silver medalist at last year’s Olympics, was second, and Christina Manning took third. The national meet is the qualifying event for the world championships, which are to be held in London in August. Harrison already had a wild-card berth for worlds, so Saturday’s fourth-place finisher, Dawn Harper-Nelson, also made the American team. Harper-Nelson was the 2008 Olympic gold medalist. Harrison, who was disqualified at the 2015 worlds for a false start in the semifinals, finished in 12.60 seconds to beat Ali by eight-hundredths of a second.